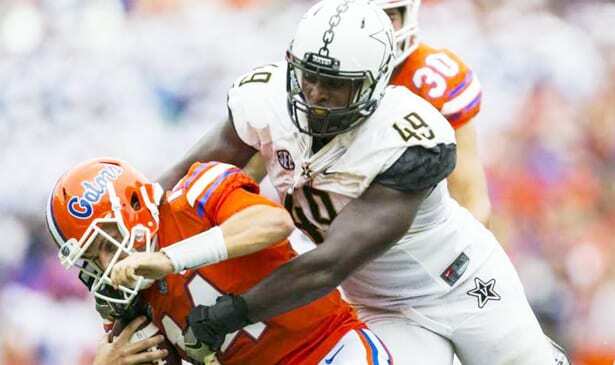 The Vanderbilt Commodores battled the Florida Gators evenly for a half, but were overwhelmed in the second half and lost 38-24 Saturday in the Swamp. Saturday was a bad day at the office for area college teams. Vanderbilt, Tennessee and and Middle Tennessee State University all suffered defeats in conference play, with a couple being rather ugly home losses. Vanderbilt, trying to recover from last week’s embarrassing 59-0 blowout defeat to Alabama, hung in for a half against number 21 ranked Florida in the Swamp. But the size and ability advantages in the line took their toll in the second half as the Gators rolled to a 38-24 victory, beating Vandy 21-7 over the final two quarters. Despite losing their starting QB to injury, the Gators managed just fine with number two Felipe Franks. He completed 10 of 14 passes for 185 yards, while Gator running backs Lamical Perine (three touchdowns) and Malik Davis (two touchdowns, 127 yards rushing) were blowing through the Commodores, Vandy QB Kyle Shurmur completed only 18 of 40 passes for 264 yards and three touchdowns. Ralph Webb gained only 29 yards in 11 carries, and other than one late score, the Commodores offense was missing in action the final 30 minutes. Neither the Tennessee offense or defense had any answers for ninth ranked Georgia. The boos began in the second quarter, and the rush to the exits was in full evidence throughout the latter stages of Georgia’s 41-0 blitz. Georgia QB Jake Fromm was seven of 15 for 84 yards and one score, but he added two rushing touchdowns. Meanwhile, UT QB Quentin Dormady was woeful. His five completions in 16 attempts for 64 yards, coupled with John Kelly’s 44 yards in 19 carries reaffirmed the ineptness of Tennessee’s offense. The calls for head coach Butch Jones’ resignation or firing are getting louder by the day. Dean Singletary’s four touchdowns and 133 yards rushing led Florida Atlantic’s 38-20 romp over Middle Tennessee State. Saturday night in the Conference USA opener for both teams. The loss completed a dismal college football day for most area colleges.